FRESNO – Celebrity football players will team up this weekend for the inaugural Big B.A.N.G. (Building A New Generation) Weekend, which will benefit roughly 30 foster kids under the care of the Keeping Youth Journeying Onward (KYJO) Foster Family Agency. 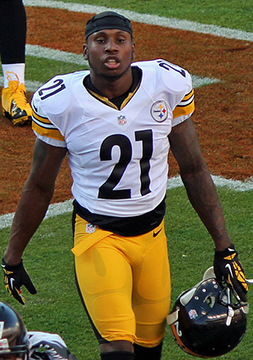 Robert Golden (born September 13, 1990) is an American football safety for the Pittsburgh Steelers of the National Football League. He was signed by the Steelers as an undrafted free agent in 2012. The weekend kicks off with the Celebrity Bowling Challenge this Friday evening at AMF Sierra Lanes in Fresno. During the challenge, youth not only get to meet National Football League and Division 1 athletes, they also get to bowl with them. After the bowling is done sponsors, celebrities and athletes will meet at the Clovis Veterans Memorial Building for Casino night, where the invited guests will partake in casino-style games, a silent auction, food and dancing. Finally, kids from grades 4-8 are invited to register for the free Believe and Achieve football clinic, which will be held on the field at Bulldog Stadium Saturday morning from from 9 a.m. to 12 p.m. In addition to being on the same field as NFL greats such as the host, Fresno’s Rob Golden of the Pittsburgh Steelers, the hundreds of participating youth will receive lunch and a free T-shirt. The weekend will end with Going Out with A B.A.N.G., a special all-white attire and red carpet event at Club Eva in Fresno. Jordan said the party is a way to thank attendees for their time and their attention paid to the youth during the weekend. “If you come to the event and make kids smile, you’ve done a wonderful job already,” Jordan said. The Big B.A.N.G Weekend will help in part by making lasting memories for KYJO’s youth, allowing them to go on trips to places like Disneyland, Yosemite National Park, Monterey Bay Aquarium, and Fresno State football and basketball games. For more information on the Big B.A.N.G. Weekend, visit http://www.kyjo.org/bigbangweekend.